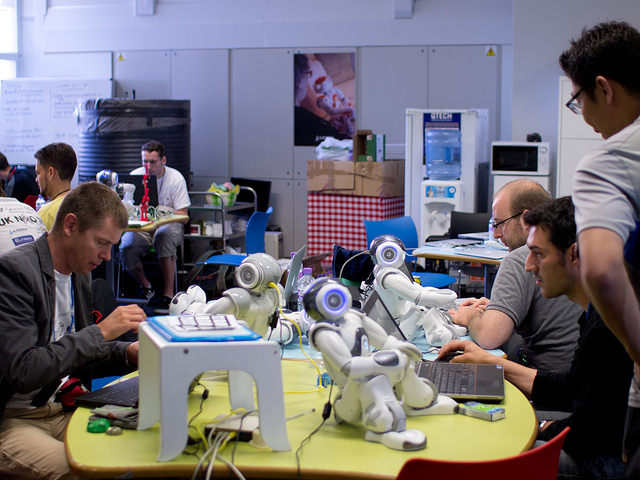 At 6pm on Friday 30th August at Queen Mary University London, the second London NAO hackathon kicked off. We had 42 attendees from 6 countries (UK, France, Germany, Italy, Finland, USA). The Friday evening was to give everyone a chance to get to know one another and form teams and so after registration, a welcome talk and a debate on whether we want emotional robots the main focus of the evening was the social event and buffet dinner at the Coborn Arms. On Saturday morning hacking started. There were a number of optional breakout sessions in the morning covering topics such as getting started with NAO development and the Aldebaran ASK NAO autism program. One of the most prolific NAO developers Franck Calzada, from France, described how he implemented some of his impressive applications in which NAO can write or draw. On Sunday afternoon it was demo time. This year we invited 34 members of the public to come to QMUL’s Great Hall theatre space and vote on the winning applications. We had a selection of prizes including books and issues of MAKE magazine generously provided by O’Reilly. Rather than having a set “1st prize” etc we allowed the winning teams to pick the prizes they wanted. The team that came first got to pick first and so on. Kok Ho Huen from QMUL also 3D-printed 1st, 2nd & 3rd place trophies using a 3D model of NAO’s head. Photographic coverage throught the weekend was provided by Ghene Snowdon of Snowdon Photography. Photos from the event can be found here. Dave Snowdon has been coding professionally for about 20 years and fascinated by robots for as long as he can remember. 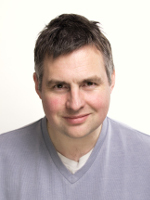 Dave has been on the Aldebaran Robotics NAO developer program for two years and is one of the founders of UK NAO, an official Aldebaran Robotics user group representing NAO developers in the UK.